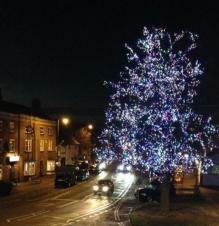 The mayor of Hinckley and Bosworth, Cllr Jan Kirby and her consort, Mr Mike Kirby are to be guests of honour at this year's carols around the tree event. 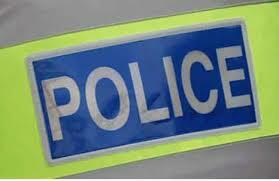 Burbage PCSO 6035 Darren Stretton, who is based at Millennium Hall, has just published the latest edition of The Beat with crime and crime prevention updates and advice for people living in the parish. New benches have been installed across the parish following a survey to find people's preferred seating sites. 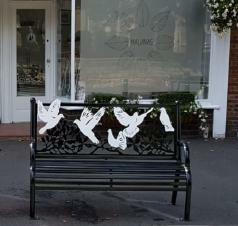 A decorative commemorative bench has been placed near the village War Memorial, to match one already there, and a second commemorative version, featuring white doves of peace, has replaced an older, plain bench outside shops on Hinckley Road, facing St Catherine's Church. An Older Voices Forum meeting is to be held at Hinckley Hub on Monday October 8th. Open to anyone aged 50 and over, people are asked to be there by 1.45pm for a 2pm start. Agenda items include discussion on community transport funding and NHS health checks for people aged from 40 to 74. The Forum meets three times a year. To find out more, contact Forum secretary Janet Clews on 01455 440475. 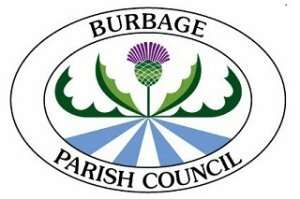 Keen volunteers and community groups are invited to attend a free event which aims to promote volunteering opportunities in the borough. The Borough Council's Dog Warden service has scooped two national awards for its ongoing work in the care of stray dogs. 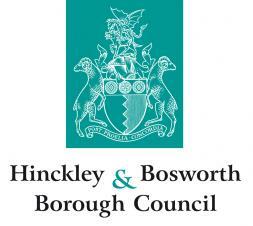 Hinckley and Bosworth Borough Council's Dog Warden Service has been awarded the Stray Dog Footprint Gold standard in the RSPCA's 2018 PawPrints Awards for the seventh consecutive year. LOCAL landlords who let certain types of properties are being urged to check whether they need to apply for a licence following recent changes to legislation from central government. The changes apply to any landlord who lets a property with five or more occupants living as two or more households. Landlords must apply to the Borough Council for a licence by 1 October 2018. HTML5 validated. WCAG compliant. Page generated in 0.0964 seconds.